How To Buy The Best Electric Toothbrush - Which? Expert tips on what to look for and how to buy the best electric toothbrush for your budget. Brushing with an electric toothbrush can help you keep your teeth and gums clean and healthy, and it’s important to make sure you choose the best electric toothbrush for you. With models costing from around £10 to upwards of £200, it can be hard to know which electric toothbrush to buy and how much to spend. Read below to find out all about the various types of electric toothbrush available, and the features we think are worth investing in. If you already know what you want and simply want to see which models come top in our tests, head straight to our best electric toothbrushes recommendations. Which type of electric toothbrush should I buy? Rotating, sonic, pulsating, oscillating, counter-rotating… there are all sorts of electric toothbrushes available and they all work in slightly different ways. Rotating These have a set of bristles that turn. Bristles can be arranged in a circle that rotates, or individual tufts of bristles can spin. Rotating-only brushes are usually the cheapest type of brush you can buy. Rotating-oscillating These electric toothbrushes have small, round heads and are one of the most popular brushes in the Oral B range. The head oscillates – rotates in one direction and then the other – around one tooth at a time to sweep away plaque. Pulsing Some rotating and rotating-oscillating electric toothbrushes pulsate to make the head move backwards and forwards against teeth while it’s spinning. This helps dislodge plaque and is a technology that’s typically found on pricier rotating brushes. Counter-oscillating These electric toothbrushes have the same head shape as oscillating brushes, but the tufts of bristles rotate in different directions simultaneously – with each tuft rotating in the opposite direction to those next to it. Dual head As the name implies, these electric toothbrushes combine two heads in one – one part rotates and the other sweeps from side to side. Side to side Rather than spinning, these toothbrushes sweep from side to side at such high speeds that they vibrate against your teeth. Philips Sonicare electric toothbrushes clean in this way. 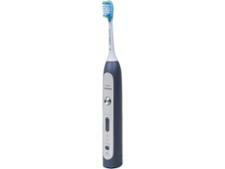 Sonic and ultrasonic These are brushes that vibrate at certain high speeds and frequencies to help break down plaque. Manufacturers of sonic brushes claim that they also drive cleaning fluid (a mixture of toothpaste, water and saliva) between teeth to help dislodge plaque. Vibrating brushes are generally more expensive than rotating models. How long will the electric toothbrush battery last for? There’s a big difference in how long rechargeable batteries last. In our tests we found the best lasted for more than 184 minutes – that’s about six and a half weeks of brushing twice a day for two minutes before you’d need to top up the power. But others won’t last as long – we found the least powerful brush needed recharging after just 16 brushes. Before you buy your electric toothbrush it’s worth considering how often you’re likely to charge it. If you plan to keep the charger readily to hand and the battery constantly topped up then it’s less important to choose a model with a powerful battery. But if you prefer to keep the charger packed away, or you want to take your brush with you on long trips without the charger, look for a toothbrush with a long-lasting battery. Find a toothbrush that excelled in our battery performance tests by heading to our expert and independent electric toothbrush reviews. How often do I need to replace the electric toothbrush brush head? You will need to replace electric toothbrush heads once the bristles are worn. Replacements are pricey and worth buying in multi-packs to keep the cost down. Most Oral B and Philips Sonicare brushes can be used with a range of different brush heads. These are designed to give a more specific clean, ie. whitening, flossing or multi-directional cleaning. They’re almost always more expensive than a standard brush head. You can read more about the various brush heads available in our guide to electric toothbrush brush heads. Basic models have a standard brush head and one cleaning programme. Higher-spec models, on the other hand, often come with a raft of features and accessories that tot up the price. Brushing timer This helps ensure you brush for a full two minutes, which is the amount of time dentists recommend we spend cleaning our teeth. Some are auto-programmed to only brush for two minutes so you don’t need to think about the time. Others will beep or stutter when it’s time to stop. Pressure sensors Harsh scrubbing to remove plaque is not necessary – in fact, pushing too hard against your teeth can do more harm than good. Pressure sensors let you know if you’re pressing too hard, with either a light or beeping sound. Some Oral B models will stop pulsing and just rotate if you’re putting too much pressure on your teeth. 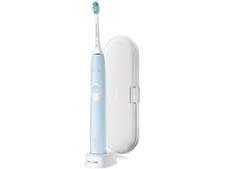 Soft-grip handles The best electric toothbrushes have a soft grip which can make them more comfy to hold and use. Soft-grip handles also lessen the vibrations you feel in your hand while brushing. Find out more about the various features available by heading to our page on the top electric toothbrush features. Which are the best electric toothbrushes? We’ve tested a range of electric toothbrushes from some of the biggest brands, including Oral B and Philips, to uncover the models that are best at sweeping away plaque to help keep your teeth clean and gums healthy. Our reviews reveal that there’s no direct link between price and quality – you can pay less than £50 for a Best Buy, or over £100 for an electric toothbrush that doesn’t reach that level. 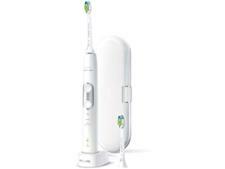 Find the perfect electric toothbrush for you by checking out our electric toothbrush reviews.